Maritime Reporter & Engineering News recently spoke with Mark Barker, president of The Interlake Steamship Company, who has sent its fourth vessel — its second 1,000-footer — to be outfitted with exhaust gas scrubbers. After seriously pursuing the possibility of converting its ships to run on liquefied natural gas (LNG) several years ago, U.S. based Great Lakes shipper The Interlake Steamship Company found that the region’s LNG infrastructure was simply not present to support such conversions. 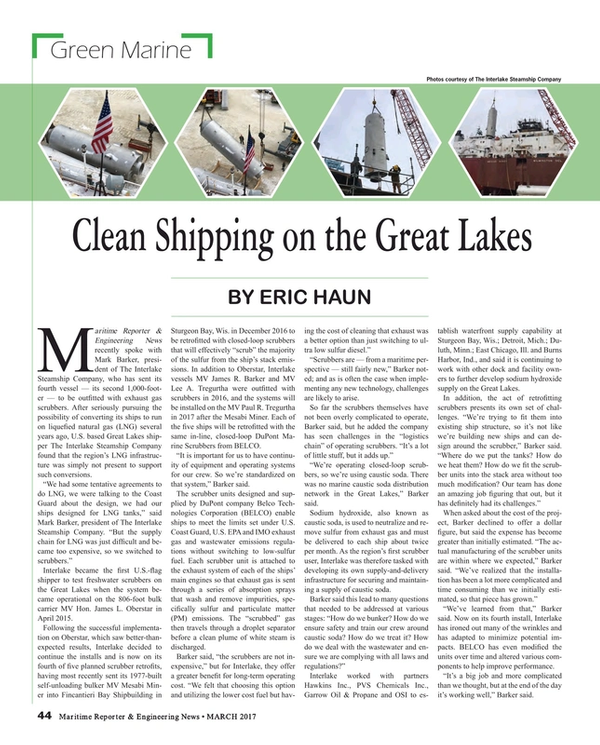 Interlake became the first U.S.-flag shipper to test freshwater scrubbers on the Great Lakes when the system became operational on the 806-foot bulk carrier MV Hon. James L. Oberstar in April 2015. Following the successful implementation on Oberstar, which saw better-than-expected results, Interlake decided to continue the installs and is now on its fourth of five planned scrubber retrofits, having most recently sent its 1977-built self-unloading bulker MV Mesabi Miner into Fincantieri Bay Shipbuilding in Sturgeon Bay, Wis. in December 2016 to be retrofitted with closed-loop scrubbers that will effectively “scrub” the majority of the sulfur from the ship’s stack emissions. In addition to Oberstar, Interlake vessels MV James R. Barker and MV Lee A. Tregurtha were outfitted with scrubbers in 2016, and the systems will be installed on the MV Paul R. Tregurtha in 2017 after the Mesabi Miner. Each of the five ships will be retrofitted with the same in-line, closed-loop DuPont Marine Scrubbers from BELCO. “It is important for us to have continuity of equipment and operating systems for our crew. So we’re standardized on that system,” Barker said. The scrubber units designed and supplied by DuPont company Belco Technologies Corporation (BELCO) enable ships to meet the limits set under U.S. Coast Guard, U.S. EPA and IMO exhaust gas and wastewater emissions regulations without switching to low-sulfur fuel. Each scrubber unit is attached to the exhaust system of each of the ships’ main engines so that exhaust gas is sent through a series of absorption sprays that wash and remove impurities, specifically sulfur and particulate matter (PM) emissions. The “scrubbed” gas then travels through a droplet separator before a clean plume of white steam is discharged. “Scrubbers are — from a maritime perspective — still fairly new,” Barker noted; and as is often the case when implementing any new technology, challenges are likely to arise. “We’re operating closed-loop scrubbers, so we’re using caustic soda. There was no marine caustic soda distribution network in the Great Lakes,” Barker said. Sodium hydroxide, also known as caustic soda, is used to neutralize and remove sulfur from exhaust gas and must be delivered to each ship about twice per month. As the region’s first scrubber user, Interlake was therefore tasked with developing its own supply-and-delivery infrastructure for securing and maintaining a supply of caustic soda. Interlake worked with partners Hawkins Inc., PVS Chemicals Inc., Garrow Oil & Propane and OSI to establish waterfront supply capability at Sturgeon Bay, Wis.; Detroit, Mich.; Duluth, Minn.; East Chicago, Ill. and Burns Harbor, Ind., and said it is continuing to work with other dock and facility owners to further develop sodium hydroxide supply on the Great Lakes. “We’ve learned from that,” Barker said. Now on its fourth install, Interlake has ironed out many of the wrinkles and has adapted to minimize potential impacts. BELCO has even modified the units over time and altered various components to help improve performance. “It’s a big job and more complicated than we thought, but at the end of the day it’s working well,” Barker said. Mesabi Miner, named in honor of the men and women of Minnesota’s Mesabi Iron Range, was built by American Ship Building Company in Lorain, Ohio and joined the Interlake fleet in 1977. Its self-unloading system includes three cargo hold belts and a 265-foot boom.